Residents in single family homes and apartments of four (4) units or less with ample space for carts can register for trash collection service. 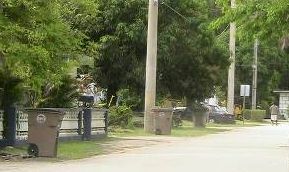 Monday through Friday, GSWA trash collection crews collect trash from the carts that customers place out at the curb. Once the trucks are full, the trash is taken to the Hauler Transfer Station where the trash is consolidated into a much larger truck and taken to the Layon Landfill where it is safely disposed in a state-of-the art municipal solid waste landfill. Approximately 20,000 tons of trash from GSWA curbside trash customers are collected and landfilled each year in the Layon Landfill. GSWA currently collects trash from about 16,500 curbside customers each week. Collection service is provided on every holiday except on Christmas Day and New Year’s Day. Each GSWA customer is provided a 96-gallon wheeled cart for the convenience of both the customer and collection worker. Customers can easily roll the cart to the curb where a GSWA employee will attach it to a hydraulic lifter on the back of the trash truck and automatically dump the cart’s contents into the collection vehicle. This automated collection only takes a few seconds and it reduces injuries and health risks for GSWA’s employees. The cart that GSWA provides each customer is the property of the GSWA and must be returned to GSWA if you should discontinue our service. 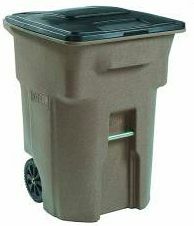 The cost for weekly curbside trash collection of one 96-gallon cart is $30.00 per month. The vast majority of customers only need one cart. If on occasion a customer needs to set out one or more additional bags of trash outside the cart, the customer must purchase an Excess Trash Tag (a sticker) for each bag set outside of the cart. Each sticker costs $4.00 and can be purchased at the GSWA administrative offices located at 542 North Marine Corps Drive in Tumon or at any of GSWA’s Transfer Stations. Customers who find that they regularly have extra bags set outside of the cart should call GSWA Customer Service Representative at 646-3111 and order a second cart to be used at the same service location. The fee for service for that extra cart is$15.00 per month, making the total monthly bill $45.00. Any additional cart must be used for that specific service location. Customers receive bills from GSWA for each month’s collection and the payments are due within 30 days. Failure to pay the monthly fee will result in a cancellation of services.